Photosensitive Material (Direct-Indirect Film) | Product Information | MURAKAMI CO., LTD.
MURAKAMI Capillary films feature uniform and flat print profile on substrates. A lower Rz and uniform surface screen profile can be achieved with MURAKAMI capillary films. Ideal for achieving consistent emulsion thickness from screen to screen, excellent deposit control for repeat job profile, easy to use, and less variables to control. MS-IK IK-50 50, 100, 150 10 640 640×640 mm SBQ type for building thicker emulsion layer. When forming a photosensitive layer with the same film thickness onto the same screen, there will be a big difference in the surface plate smoothness depending on whether the direct method or direct-indirect method is used. In the direct method, in which a liquid form photosensitive material is applied by a bucket, a variance occurs in terms of the film thickness within the same plate. In contrast, in the direct-indirect method, in which we use a film that is applied while controlling the film thickness at high precision, the difference in film thickness within the plate can be made extremely minuscule. 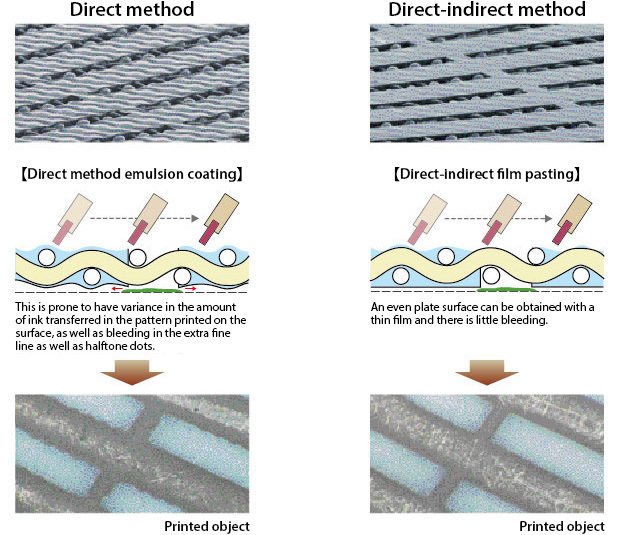 For high-precision printing, the film thickness and surface condition must be stabilized. It is possible to simplify processes in thick film plate making that are time-consuming.